Is it late at night and you feel at your wits’ end? Are you tired of coming up with new ideas for all your lessons? Here are a few tips to find ways of providing your students with useful activities that will cater for their needs and interests; and best of all, they do not need over planning. Sometimes, online resources can make it extremely easy for teachers to plan a lesson, but it`s always a good idea to keep in mind that our internet connection may not work. Read on and you`ll find a few ideas on how to plan easily, making the most of online resources and students’ preferences, and how to get going even if the computer deserts us. If you work within the frame of an institution where syllabi have to be followed and deadlines have to be met, then you will find fun ways to fit all the required content in your lessons skipping boring activities from textbooks in this guide. First of all, think of all those times you had to point out the same mistake to your individual student. Can you remember what mistake it was? Let’s imagine he or she keeps mistaking adjectives ending in -ed by those ending in -ing. One idea is to come up with phrases using them, or cards. See how well your student can use them, within a certain context. How can we put a long list of adjectives, which are quite confusing for them in context? The best part of having a private individual student is that, after a number of lessons, it is quite likely that you may have become acquainted with their lifestyle and routines. Well, using this to our own advantage, we can provide questions, e.g. how he felt when he saw a certain film, or last weekend during a party he attended. If he does not come up with anything, talk about the characters in the film, or people in the party. Then, visit http://learnenglish.britishcouncil.org and you are sure to find videos where people use these structures. Why is it a good idea to focus on error correction with adult students? Because, unfortunately, there is a process called fossilisation, which according to some authors takes place sometime in adulthood preventing students from correcting certain errors acquired in earlier years and are let to fossilise in the incorrect form. Whereas this might take place in certain learning processes, it’s not as generalised as you might think. Taking our students’ vices and using them for error correction, fossilisation can be dealt with effectively; and apart from that, adult students consider it worthwhile attending a lesson where they can experience a tangible improvement, as in this case, the eradication of a deep-rooted error in their performance. Adolescents need to feel identified with content, because not many of them have an intrinsic motivation to learn English. The best thing to do is find out about the bands they like listening to or the series or sitcoms they enjoy watching. It is unbelievable how much can be taken out of a sitcom episode or a song, and how dynamic and enjoyable your lessons can turn when you use that kind of material. If you need to teach them, say, wishes and regrets + unreal tenses, do not follow a boring textbook. Find a video of the Big Bang Theory or the Simpsons where the main characters make a stupid mistake, and try to elicit what the characters wish they did or had done. The only thing you need to do is find the videos on the internet, because the rest can be written on the board. You can encourage them to act out or role play a situation where the characters find a solution to make up for the mistake they had made. Do not play a whole episode, as that can lead to unrest and consequent misbehaviour if your students get too bored and are not kept busy. With songs, choose one of those lyrics that tell a story, such as Norwegian Wood, by the Beatles; or Skater Boy, by Avril Lavigne – though any by Amy Winehouse might do the trick as well; or by any other artist you consider they will like. If you choose to use Youtube videos for these activities, it`s advisable that you download them on your computer or usb drive beforehand so as to prevent any delays that may lead to class disruption. If your class includes students in their early teens, you might often find it hard to keep them involved and motivated to take part in the activities. Something that has always worked with great results for me is turn every activity into a competition. Even the simplest Tic-tac-toe game can provide an endless source of motivation, which will make your students participate in ways you have imagined they were able to. A good way to do this is by dividing your class into two teams and awarding points for correct answers or the most creative contributions. The thrill of winning can be continued in subsequent lessons, so that they can plan their moves in advance. Competitions of this kind will help increase the sense of belonging within the class and create stronger bonds among students. On top of that, if they are having fun, there will definitely remember what they are learning. The best way to round off a successful and memorable lesson with adolescents (the most creative age group) is have them do things with the language. What do I mean by doing things with the language? I mean putting into practice what they have learnt in a creative way. In this case, you might collect their ideas on how their characters might have solved their mistakes, and suggest they film a video or draw a comic strip with those outcomes. If you have chosen to work with a song, you can encourage them to change the lyrics using the wishes and regrets elicited in the previous activity. If there are any musical talents in your class, you can even have some live performances! These are great ideas to make them feel involved while blending their hobbies or talents with English learning, and apart from that, you are sure to be in for some rewarding surprises because once they let their imagination roam free, the sky is the limit for adolescent students. What can you do if you realise you have run out of material and you still have around 20 minutes to go before the lesson is over? Well, do not panic. You can always resort to idioms. Make sure to have a list of idiomatic expressions for simple functions like greetings or talking about the weather at hand, for elementary students and have them create dialogues in pairs including those new phrases. If you are teaching more advanced students you can come up with lists of expressions to talk about money, relationships or friendship and then use them for further discussions. Use them creatively. In order to elicit them from your students you can try the following questions: When was the last time you…? Have you ever…? And let them tell each other anecdotes. Once that is ready, you can find a video where they can identify what idiomatic expression can be used to describe the situation, or a short recording where something happens. The sources can be any of the videos on Big City Small World, or Express English from the BBC Learning English website. Depending on how much your students like talking, this activity may take anything from 20 to 45 minutes. Flashcards! If you have never used them, it`s high time you started your own collection which should include: animals, clothes, food, classroom material, places around town, toys, etc. Make sure they are laminated or are made of some resistant material, as they will be handled by your students and used for different games. Many text books for children’s courses include a set of flashcards, but if you are not willing to work with a textbook or purchase it, flashcards are easy to get online. You can also sketch them and have your students colour them for you. That will make them feel they are contributing to the production of material for their lessons. Flashcards can be taped on backs or hung on walls to entertain them for quite long periods. For example: tape one flashcard on each of your student’s backs and tell them that they will have to find out what picture they have been given. In order to do so, they will have to ask to one another “Am I a mouse?” until they receive an affirmative answer. Make sure there are no glass doors around, as they can easily find out what their card is without asking. Once they have discovered them, they can get a new one. You can also have other games with flashcards hanging on the walls. Display flashcards all around the classroom, play some music and let them dance in the centre of the classroom. Stop the music unexpectedly and call out the name of one of the pictures on the flashcards. All the children will have to run towards the right one. Make sure there are no chairs or sharp ends of furniture they can bump into in the way. An excellent and more often than not forgotten activity is storytelling, It is a wonderfully complete activity for lessons because, by telling a story, you will be developing the four skills in the following order: Listening, Speaking, Reading and Writing. We should always bear in mind that story telling is not merely reading a story aloud. It involves the use of body language and an effective tone of voice for each part of the story in order to convey feelings and create the perfect atmosphere for each part of the story. Repetition and some visual aids in the form of pictures will also make children feel involved throughout the session. The only thing you need to do to prepare a story telling session is take any story for children from the bookcase – one that is colourfully illustrated – and start the lesson. Use pictures and tones of voice to communicate some of the events, and remember that a key element is story telling is the children`s participation. So, choose stories where there are elements that can be repeated and identified by the children. Keep asking questions to check they are following the plot and encourage them to use gesture if they cannot remember words. After you have finished telling the story, they will surely want to listen to it again. This is a great opportunity to revise the vocabulary and structures you have focused on. After that, you can suggest their acting out the story, if you think they will enjoy it. If not, they can draw little pictures of the characters and make finger puppets, which might work if your students are too shy to act out. As you can see, by taking into account your students`s needs and preferences, you can pick a few of these ideas and come up with activities which they will both enjoy and profit from. If you have any questions for Karina or would like to add some additional advice please leave your reply in the comments section at the bottom of the page. 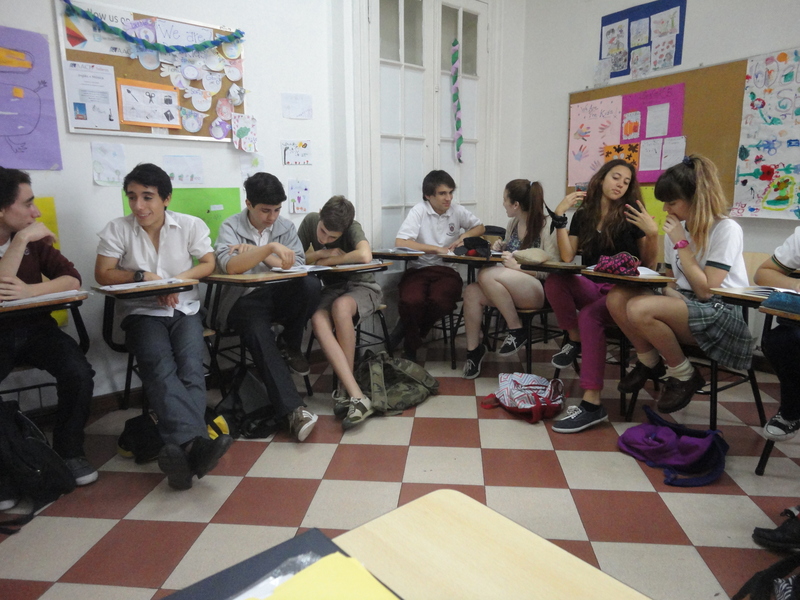 I am a TEFL teacher with years of experience working in Argentina and the UK. Evidently, a bit of organization and careful thinking leads to informed decisions. Very interesting ideas to look into students’ learning process!